v. : ill. ; 21-28 cm. Description based on: Vol. 15 (Feb. 14, 1969). 2 Gabber February 20 February 26, 2014 Beta Sigma Phi Laureate Epsilon Theta members will be attending Sunshine City councils Sweetheart Luncheon on Marchand and Susan Henry and their committee have planned a celebration for the chapter sweethearts. Laureate Epsilon Theta is very proud chairmanships. She has worked chairmanships and serving on many committees. Her daughter Laurie and her family live here in St. Petersburg. She enjoys family outings, being with her grandchildren, volunteering in numerous organizations and a variety of crafts. She is truly a Sweetheart to all who know her. Congratulations Sunshine City Council will host an Ice Cream Social on Saturday, February 22 at the Elmer O. Smith Masonic Lodge in Pinellas Park from inviting ladies who have expressed an interest in learning more about Beta Sigma Phi. Members from the local chapters will be attending as well to provide information about their chapters activities. Join the Florida Suncoast Chorus Florida Suncoast Chorus is the only active chapter in Pinellas County of the international Barbershop chorus meets each Monday evening at the Largo Community Center. Directed by Tom Roan along with Associate Director Lance Lubin, this harmony. The chorus is dedicated to musical education and having fun singing. funds to buy music and pay expenses valentines and several shows a year. New members are always welcomed. You dont have to read music as singing tapes are provided. But you need to be able to sing on key. Prospective members should call Save Our Strays needs volunteers to foster felinesSave Our Strays phone requests this month are all about baby kittens that need to be rescued. And SOS foster homes are full. Can you temporarily help foster a cat or litter of kittens for Save Our Strays? Applicants must be able to drive, have their own transportation and be available for a home visit from a current volunteer prior to fostering. If you are interested and willing to aid kittens in need, north county south county pet lovers may call at sos@saveourstraysinc.com Save organization dedicated to rehoming abandoned cats and kittens and does not maintain a shelter facility. 4 Gabber February 20 February 26, 2014 Heroes on Central Gingrass and John Reed (unrelated to the driver) likely saved his life. Reeds work truck, a pool cleaning truck, hit a power pole while he drove Thats where Gingrass and John Reed sprang into action. convince police to let him move his car from behind police lines so the duo could One of the two welders had a knife in his pocket and cut Reed free. The on his hands. Both men declined to have their photo taken and hesitated at the idea they were heroes. Gingrass explained that, as welders, the pair burning car. Gabber February 20 February 26, 2014 5 Heritage Village Seeks Volunteers are offered a unique chance to help citizens connect the past with volunteers provide the community with a greater understanding of local and state history and underscore the importance of preserving history for future generations. Learn about volunteering with a volunteer orientation to be held on This orientation is planned for adults interested in becoming docents/tour guides, historic house caretakers and museum greeters. The meeting will be held in the For more information about volunteering or the orientation, call history museum brings more than structures, and experience historical exploration. Paths wind through 21 acres and connect with the Florida Botanical Gardens. Lithuanian-American Club Lunch The Lithuanian/American St. Petersburg is serving lunch every Thursday at 1 p.m. The winter schedule of luncheons is one week koldunai and the other week cepelinai. The cost is $7 for entree, side, dessert and coffee. This Thursdays menu is cepelinai (grated potato meat dumplings) served with bacon and/or sour cream, dessert and coffee. As usual, they have Lithuanian beer and fresh baked bread to buy every Thursday. information. Everyone is welcome. 6 Gabber February 20 February 26, 2014 Donation, from front page by Foundation Executive Director Treasurer for the Foundation Board of Directors. BrightHouse recognized the important role the Foundation plays enhance educational, health related, recreational, and socialization programs and events offered through the Gulfport Multipurpose Senior Center in Gulfport, Fl. The Senior Talent Shows, held in Pinellas, Pasco, Hillsborough, and Manatee Counties are the prelude to BrightHouses annual Senior Idol Show. The three winning acts will compete at 7pm on April 22nd, 2014 at Ruth Eckerd Hall. The Foundation is pleased to add BrightHouse Networks as a Community Partner in ongoing efforts to enhance the participant experience at the City of Gulfports Multipurpose Senior Center. Cupcake, from front page the money to charity. This year, Jakes in sixth grade at Madeira Beach Elementary and doesnt need a community service project, but hes reprising the run all the same. Sweet! of St. Petersburg has agreed to donate 200 cupcakes, and Jake will donate all the money raised to Rise Up St. Pete, a group that encourages mentoring and neighborhood cleanups in St. Petersburg. donate the money to] childhood obesity, he says. His mom Michelle And he was like, Mom, I dont think thats a good idea. Registration for the time event costs Friday. Race day registration costs Market offers Free Space for Non-Prots The Gulfport Tuesday Fresh Market continues its program of offering one free vendor space each week for event. Groups may use the space to offer free information, promote upcoming events and community outreach, to raise funds, or to sell Market managers. All funds raised in entity. currently being scheduled and any groups may apply to use the space as available in upcoming weeks and use of the space in recent months include library boosters, historical society members, environmental advocacy groups, community health organizers, art and theatre groups, veterans groups, animal rescue organizations and many others. For more information and to apply, please contact Daniel Hodge, Fresh Market Coordinator by email to dan@ igc.org. Fine Dining every Friday Come join them at the Sons of Italy, reservations. 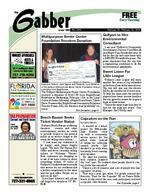 8 Gabber February 20 February 26, 2014 2014 County Recycling Directory now Available The new Recycle Today: 2014 Pinellas County Recycling Directory has just been released. The directory is packed with the latest information about how to recycle in Pinellas County including local options for recycling cans, glass bottles, plastics electronics, chemicals and motor oil. Find out the new recycling options that are now available in Pinellas County. Many municipal recycling programs have been improved and citizens are encouraged to check for the changes in their municipality. Citizens can pick up a free copy at local libraries, Natures Food Patch centers. The directory may be viewed online at www.pinellascounty.org/ recycle. Recycle Today is published by the Solid Waste Division of Pinellas Countys Department of Environment and Infrastructure each year to make recycling easier by providing detailed and updated information on local programs, including: recycling programs offered in the 24 municipalities plus the unincorporated areas of Pinellas County computers or paint recycling mulch Guide for Recycling and Disposal asked questions about recycling handle their hazardous waste at Work Assessment to increase your business recycling Recyclin Roadie, a brightly painted mobile recycling trailer, for your next event events for the whole family To learn more about recycling, visit www.pinellascounty.org/recycle or Learn about the Everglades Restoration Superintendent of the Everglades and Dry Tortugas National Parks, will present Everglades National Park: People, Pythons, and Billions for Restoration on Tuesday, February St. Petersburg. Admission is free. superintendent of Everglades treasure and a revered natural million acre fragile ecosystem which largest national park in the lower endangered. The park includes the largest freshwater sawgrass prairie in North America and the largest protected mangrove ecosystem in the Western Hemisphere. In his article, Sea Change author past hundred years, the Greater Everglades, once a vast sanctuary of freshwater shallows and sawgrass, has shrunk to half its original size. Canals and levees, dug years ago to spur urban and agricultural growth, have drained thousands of acres of wetlands. 12 Gabber February 20 February 26, 2014 FWC, U.S. Power Squadrons boost boating safety efforts The Florida Fish and Wildlife Conservation Commission (FWC) has enjoyed a strong partnership with the U.S. Power Squadrons for years. Recently, the FWC provided Squadrons units across the state. The kits will be used by instructors life jacket use and to show students how easy it is to wear a life jacket all of the time while boating. Organizations like the Power Squadrons are a critical part of boating safety efforts in Florida and across the country, said Brian Rehwinkel, FWC Boating Safety Outreach Coordinator. The instructors with the Power Squadrons contact a new boater will encounter, and the information learned in a boating safety class can make a big difference on the water. Life jacket kits were purchased through boating safety grants for approved boating safety classroom courses in Florida. With life jackets, seeing is believing, Rehwinkel said. Having the life jackets in hand will allow instructors to show students how easy it is to wear them all the time while boating. Life jacket wear does make a difference. Statistics show that more were attributed to drowning, which life jackets are designed to prevent. We want to promote the message that there is a wide variety of comfortable, affordable and stylish life jackets on the market today, Rehwinkel said. It is easier than you might think to keep you and your passengers safe. The project with the Power Squadrons will help get that message out to those enrolled in boating safety courses. educational organization dedicated to making boating safer and more enjoyable by teaching classes in seamanship, navigation and related subjects. The FWC is supportive of organizations who teach approved boating safety education courses in Florida. For more boating safety information, visit MyFWC.com/Boating. Hounds 4 Heroes Seeks Volunteers Hounds 4 Heroes of Tampa Bay, a trains retired racing greyhounds to be service dogs for veterans with Post Traumatic Stress Disorder (PTSD). You may have seen their dogs, which are provided to their handlers at no charge, walking on the streets of As a fundraiser, they will be doing gift wrapping at Barnes and Noble during the holidays and they need volunteers to assist. If you would like to donate a few hours to work, veterandogs@h4htb.org. Gabber February 20 February 26, 2014 15 lanes, rezoning of two properties for higher density living and the insertion of bicycle lanes. The CCP was designed to allow the citizens the event of a hurricane or other disaster. The BOCs ethical guideline is to do no harm. If the BOC had any common sense they would realize that public safety holds a higher priority than bicycle lanes and capital gain from taller buildings. I chose to run because we need to infuse the BOC with more common sense. ME: I have been on the commission for the past three years and have thoroughly enjoyed it. I enjoy giving back to the community and would welcome the opportunity to continue serving. AP: I have been on the Commission Commission needs continuity and stability at this time. Seven generation of my family have lived in Florida since the late 1700s and Condominiums, I am truly devoted to South Pasadena and our great State. How can voters contact you? HB: I will always be available to ME: I may be reached via email at maxelson@ymail.com. AP: If anyone has any questions concerning my campaign or recommendations for our city the best way to contact me is by my email at apenny@tampabay.rr.com. RS: Ive been a full time resident for book. When elected, youll be able to reach me at city hall too! Contact Cathy Salustri at CathySalustri@theGabber.com. 16 Gabber February 20 February 26, 2014 327-8855 5412 Central Avenue327-8855 Come See The Difference!Come See The Difference! Come See The Difference! Exceptional Eye care, Distinctive Eye wear Contact Lens Specialists Dr Dennis Ryczek Vision Correction without Surger y luding Evenings We Accept Most e A/EYEMED The Art of Making Change: Part Two Did you make any New Years Resolutions this year? Hows it going? Wait! Dont hang up. When you make a New Years Resolution, you are asking yourself to develop a new habit. Your choice: escalator. But new habits take time to take over, more time than you think, if you think about it at all. And if youre not thinking about whats involved in making change happen, then its no wonder youve forgotten what your 2014 resolutions even were. I failed missing? Welcome, Dear Readers, to the off ramp of the Wheel of Failure: The Art of Making Change is a continuation of last weeks column that invited you to tear up your list of New Years Resolutions and begin again. In Jeremy Deans compelling new book, Making Habits, Breaking Habits: Why We Do Things, Why We Dont, and How to Make Any Change Stick, he assures us that new habits can be formed, but how long it takes varies greatly. On average, it takes 66 days for a new habit to take over your life. Two months or more of everyday attention, writing it down, keeping focused, telling a friend, working with a coach or an accountability partner. Why so long? Because neuroscientists know the brain has a mind of its own. It resists change and would rather nap in front of Duck Dynasty. When you mindfully decide to let go of an old habit and replace it with something less fried and sugary, something better for your sleep, digestion and overall health, you wake up to a new understanding of what drives your habits. Acting without thinking drives our habits, reports Dean. Scientists who control reality we all live in, they have given it a name. Its called automaticity, and learning to move through it and act from a place that is more authentic to your personal vision of health and wellness paves the way for successful change. And so does: ACTING ON WHAT YOU VALUE. create a visualization, a detailed mental picture of who you are, where you are, what you feel when you see yourself living a healthier, happier life. I see myself with my husband, hiking in Florida and camping over night with our grandchildren. I love them to bits and they love being with What you value will express itself in your personal wellness vision. Make make this a DIY project, or recruit a close friend, or consult with a local wellness coach. SET GOALS, STAY POSITIVE, BE PATIENT. Once your wellness vision is created, you have a target to aim for. Next, youll want to create the small, realistic goals that will get you there: week by week. Change is not linear. Expect setbacks and delays but avoid despair. In fact, stay very, very positive. Thats what all the research shows. celebrate what you did do. Beating lasting change. for a new habit to take hold. An exercise habit takes even longer. A people who write down a detailed, likely to achieve their goals. Fifty percent is huge! Gabber February 20 February 26, 2014 17 14 19 49th Str eet S. 7 27-3 2 1-6 96 5 A dvertising@theGabber .comDisplay Ad vertising fr om $1 7. 20 per column inch. 18 Gabber February 20 February 26, 2014 This Weeks Solution Garden Club of St. Petersburg Events The following event will be held at the Garden Club of St. Petersburg, gardenclubstpetersburg.org. 10 a.m.: Growing Tropical Clumping Bamboo in Your Yard with guest Island Bamboo. February 20: Preview Night with Free. Proceeds support Club projects including Scholarships.Become A Lifeguard in order to continue in the class. water for 2 minutes using legs stopping and swim 20 yards, surface dive and retrieve a 10 pound brick from bottom, resurface and swim back to the starting point and exit open. Session I dates: February 22, information. Call for Vendors Island Festival, an annual event celebrating culture of the South Pinellas Gulf Beach Communities, will be held at Gulf Beaches Historical Beach, on March 1st, 2014. Artists, crafters and antique/collectible vendors are invited to participate. There will be space for 40 vendors the museum. There is no fee, but a donation would be greatly appreciated in exchange for your participation. Email gbhm2012@aol.com or call information. 22 Gabber February 20 February 26, 2014 By Matthew Margolis Fences and Leashes Save Lives For many of the same reasons you off to daycare alone, its also not a good idea to let your pooch roam the Animal Control... Unless you live on a large plat in Montana, your pup or a fence when cavorting in the great outdoors. In short, its dangerous. I once had a client express concern about a woman who frequently walked her dog in his neighborhood. This woman would drape the leash around her neck, and her dog would The dog was a large mixed breed, and my client had a dachshund with a bad habit of barking at the big guys. The problem was that my client wasnt convinced this woman had any control over her very powerful dog. According to him, she would frantically try to hook the leash to its collar when she saw other dogs or people approaching. Even after guy would pull and lurch, all but canine disaster waiting to happen. Question: Where do these potential disasters play out most often? Answer: Wherever dogs gather ... The best thing you can do for your pooch is be in control of his immediate environment. This means a leash or a fence when he isnt inside. Frankly, I dont get the hype about dog, but mine exhibit nothing short of joy when I bring out the leash. No fear, no hostility, no evidence of any consistently harnessed and shackled to me during most of our outdoor excursions. Most because there are exceptions. Again, those fences. A fenced backyard is a great place or improperly fenced backyard, though? Heres a story thatll break your heart. Our dog was hit by a car on Saturday, and I am overwhelmed with grief from the loss of her. I loved that dog so much. We recently bought a home and moved into it in early June. There is a hill in our backyard, and we were concerned that Lucy could jump the fence. We planned to have a new fence built, but after testing Lucy, we didnt think she would jump it. On the 4th of July, we left the house, not even thinking about the wondering whether Lucy was scared. She was gone when we got home, but thank God someone had found her and picked her up and called us. She said she almost hit her. My husband stayed home from work the next day to be with her, and he boarded up the part of the fence that was the lowest. We went to the movies that night, and she was still there when we got home. We went to the beach during the day on Saturday, and she was still there when we got home. So we left again Saturday to go out. All night I had my cellphone out, waiting for a call that someone had picked her up. I made note of when been hit by a car. Now, all I can do is cry all day and all night. It should be a joyous time because we bought our new house, but I hate that house now. All I can see is Lucy. When I look in the backyard, I bawl. She really loved her new backyard. I am so overwhelmed with guilt. I keep saying, why did we leave? Why didnt we leave her in the house or even in her crate? I am so miserable. I feel so lost, so empty and so guilty. She was just the best dog. Such a sad story. Such an unnecessary loss. I wish there were something I could say to make this woman feel better. The only thing she can do now to feel better and honor the loss of her loved one is acknowledge her mistake and share her story. Thats why I included it. She shared it with me, and Im sharing it with you. Please take it to when out and about. 24 Gabber February 20 February 26, 2014 Local Writers Speak at Boyd Hill Come hear Gabber columnist and reporter Cathy Salustri will join Tampa Bay Times writer Jeff Tampa Tribune staff writer Wendy Joan Biddlecombe, and USF St. Petersburg Associate Professor of English Dr. Thomas Hallock for the We Find Nature in the City? on Friday, February 21. As part of the Boyd Hill Writers in the Preserve series, the writers will work. Cathy Salustris reading will focus on Clam Bayou. Manzione, Gloria Muoz and Brian Duncan will lead a poetry night hike through the Preserve. The series concludes on April 11 Community Gathering, as writers, environmentalists and community advocates celebrate the natural and built environment of south St. Petersburg. This lecture series demonstrates the extraordinary talent at USF St. Petersburg and our commitment to engaging the community with provocative programming, said Frank Biafora, Ph.D., dean of the College of Arts and Sciences. I commend Dr. Hallock for his creative leadership. USFSP Florida Studies Program, the College of Arts and Sciences and Friends of Boyd Hill Nature Preserve. Andrea Andersen. Each event is free and open to the public and starts at 7 p.m. For more information contact Thomas Hallock Club Way South in St. Petersburg. Ducky Event to Benet All Childrens The All Childrens Hospital Guild Beach Branch members will present starring Sir Duck. This year Ducky Goes to the Oscars will be presented at The Club at Treasure Island, 400 Island Causeway in Treasure Island. place on Friday, February 21 from Festivities include dinner, open bar, silent and live auction. Music will be provided by First Take. to All Childrens Hospital for predetermined special projects for the children. Please contact Annmartine or reservations. Rhode Islanders to Picnic Come out for a picnic in the park with other Rhode Islanders on Monday, March 10 from 10 a.m. to dusk at Fort DeSoto Park, St. Petersburg, East Beach (2nd shelter on the right #14). This is a covered picnic shelter and everyone brings their own food/drink and utensils (alcohol not permitted by the park). Please bring a casserole, salad, or dessert for everyone to share at the pot luck table. This picnic is always held on the second Monday in March. 26 Gabber February 20 February 26, 2014 Dear Pat: The asphalt driveway at my house was replaced just several years ago, but some cracks have developed. I have tried to repair them, but they keep opening up. How can I make a permanent repair? Dear Anna: It can be very disappointing to install a new driveway that looks great and then have ugly cracks form in just a couple of years. You should contact the company that installed the new asphalt driveway to see if they will repair it for you. like new again. Since your asphalt driveway is relatively new, serious cracks indicate there are some problems with the gravel base. The asphalt company should have totally removed all the old asphalt, leveled and compacted a gravel base, and then laid the new asphalt layer. With an unstable gravel base, for whatever reason, there probably is not a permanent repair for the current cracks. This does not mean you cannot make repairs that last several years, but smaller cracks appearing through the repair are probable. Smaller cracks are easier be small enough that they are not an aesthetic issue. Another problem you may have had with the repair is you did not follow the repair material manufacturers instructions. People typically dont read the instructions thoroughly and The repair material instructions may also recommend a maximum thickness for the repair. Filling the entire depth of a deep crack can result in too much shrinkage. If ideal depth of the repair material should not be more than twice the width of the crack. Dont give up and assume things are hopeless because it is important closed as possible. Wherever there is a crack, water can seep through it into the ground. This will make the base even more unstable. No matter what type of repair material you select, clean out the crack as thoroughly as possible. This is important so the repair material has a solid surface to which to adhere. Use a screwdriver to dig out any big chunks and then a stiff brush followed by a wet/dry vacuum repair materials available. When repairing a smaller crack during warm weather, a pourable type of material works well. Repair material gun works well anytime and makes it easier to eliminate voids. Once the repair material is installed, sprinkle it with sand, place a piece of plywood over it, and drive the car over it to level the surface. Gabber February 20 February 26, 2014 27 Town Shores ShufeboardHigh scorers in the game of Hoss Collar played Feb 7 when the Pass-A-Grille club visited. L-R Jim West (PAG) and partner Nelson Burchat (TS) won with 199 points, while Winona Loucks ( PAG) and partner Jim Greene (TS) took second place with 134 points. Winona and Nels won last year also. and social gathering. With 21 from P.A.G. and 24 locals attending, two games were played followed by a short respite with abundant refreshments at the clubhouse. A third game was started and then the rains came resulting in a on the morning of Tues. Mar.11th to close out the two annual home and home visits. Island Festival Coming in March On Saturday, March 1, the Friends of the Gulf Beaches Historical Museum (GBHM) will kick off Island Festival, an annual event celebrating culture of the South Pinellas Gulf Beach Communities. Starting at husband Bill will be entertaining with original music played on banjo, dulcimer and guitar along with Susans stories. St. Pete Beach Fire Fighters will be grilling hot dogs, burgers and more. Everyone knows cooking! The Florida Suncoast MG Car Club will have their vintage cars all shined up for display. Organized British car club in the Tampa Bay area. be on stage with old time gospel Dave, The Dynamic Duo playing music from Dave Matthews, Bob many more and will play requests and The New Horizon Band from Eckerd College will perform for their The band is a national program at Osher Lifelong Learning Institute at Eckerd College that encourages people in the community to pick up an instrument and learn to play in a group. the Museum displaying jewelry, collectables, hobbies, art and photography work. The GBHM Friends will have a special Treasure Booth, costumed guides will be handing out historic notes, the Museum along with its gift shop will be open. At noon there will be a historic basket auction. Take your childs photo with Mr. Friendly and get a special badge. The Festival is open to the public and there is no admission fee. The property is handicap accessible. Island Festival at Gulf Beaches www.gulfbeachesmuseum.com. Gabber February 20 February 26, 2014 29 Porch Party: Equal Pay for Pinellas Teachers When did your child's teacher answer may surprise you. While younger teachers have always received a salary based on things other than the color of their skin, Pinellas teachers didn't always get equal pay. When did Florida start paying teachers equally? constitution, provisions were made for separate educational facilities based upon race. White segregated schools and their teachers also were limited to serving in schools of their own race. remedy large pay disparities that its members faced in comparison with their white counterparts. Florida historian long struggle to achieve equal pay and places this battle within the context of the Civil Rights Movement in Florida. Jon Tallon will give an informative history of Pinellas teachers and their battle for equal pay. Tallon, an elusive "Florida Native", cut his teeth on Pinellas county politics and police work. Tallon will speak at the Gulfport Historical Society's February interpretation of the battle for equal educator's pay in Pinellas County. FL. A two time graduate from USFSP, the former athlete and current basketball and softball coach, became involved in studying the legal activism of Civil Rights movement after entering the Florida Studies spent 12 years working with was often tasked with archival research. Among his most prized possessions is a signed copy of Thurgood Marshall's biography. Porch parties are free. You may bring a dish to share, although it is not necessary. All porch parties are free but the museum accepts donations and new members at any time. BYOB. The Gulfport Avenue South in Gulfport. Please for more information. Built Circa 1927 Indoor/Outdoor Dining Plenty of FREE Parking Indoor/Outdoor Dining Plenty of FREE Parking $1 1.95 $8.95Prime Rib Mondays New Sunday Hours ~ Open Noon for LunchMacadamia Crusted Mahiw/ small slaw & mashed SPECIALS DISCLAIMER: While supplies last. Dine-in only. No sharing. Not good with any other offers. Expires: 2/23/14 Expires: 2/23/14 Sunday, Noon~4pm 2913 Beach Boulevard 727-343-2583 BacknBlueCafe.com Toddler Storytime Come join them at Gulfport a.m. They read stories, sing songs, blow bubbles and meet other caregivers in the community! For more information contact Cailey at us. Gabber February 20 February 26, 2014 31 Dance to the Sounds of Dixieland The Bourbon City Ragtime Band will be performing at the Polish SE (next to Coast Guard commissary) on Friday eveningFebruary 21st from The public is welcome to enjoy musicians on the banjo, guitar, trumpet, keyboard and drums. Come and enjoy the evening with this great Cost is $7 at the door. Cash bar and Open Call for Flash Fiction and Nonction Trace Taylor Publication invites all Gulfport and surrounding Pinellas County writers of any age to submit manuscripts for possible publication in either or both up and coming new annual anthologies, The Gulfport Submission Requirements: paragraph author bio. manuscript (submitted to more than one publisher or journal) will not be accepted. Pays selected writers two copies of publication and credit listing in which their work will appear. Writers retain all copyrights to their work. Revenues from sales will support the annual Youth Writing Workshops and Contest. Call or email for submission forms gmail.com Reading Paws at the Gulfport Library Did you know reading to a pet can help boost your childs literary Maya, the reading assistance golden retriever. To make an appointment with Maya please call Cailey at mygulfport.us. Maximo Police Resource Center Stop in to the Maximo Police Resource St. Petersburg to see what information they have available. They offer discounted books, free seniors. You can drop off donations for our troops overseas, pick up bus schedules, and get information on City and County services. They also provide pamphlets, guides, maps and discount coupons for City and area attractions. Check them out. Gabber February 20 February 26, 2014 33 String Quartet Concert The Circle of Friends of the Gulfport Library is sponsoring a string quartet music concert on Thursday, March 6th at 7:00 PM at the Gulfport from Roots to Ragtime, the members of the quartet, Frances Pisacane and Julie Tollen, violins, Myron Rosenblum, viola, and Ruth and play music by Corelli, Telemann, Haydn, Mozart, Beethoven, Borodin, Dvork and Joplin. Admission is free, so come on over to the library and enjoy delightful music performed by professional musicians. For more information contact Cailey at cklasson@mygulfport.us or call Beginning Readers & Writers Workshop Attention! Parents of Beginning This workshop will be on March 1st, Trace Taylor and the Gulfport Public Library will be presenting their beginners reading and writing skills. To reserve your seat, call the the Reference Desk. Tracetaylorpublishing@ gmail.com Book Donations Needed Donations of books are needed by the Bookstore of The Friends of the West St. Petersburg Community Library located on the St. Petersburg College Gibbs Campus, corner of proceeds from the sale of these items are used to fund special childrens community. They are a volunteer provide a receipt to you for your possible tax deduction. Please call Wii Bowling at the Senior Center The Gulfport Groovies meet up at the Gulfport Senior Center located at Thursday at 1 p.m. to challenge each other at a game of Wii Bowling and practice for the next competition. Wii Bowling is easy to learn and fun to play. Come down and give it a try. Must be a registered Gulfport Senior Center member. Membership is easy of age or older. For more information, Bring Your own Computer Social Media Class Ever wonder what Facebook is all about? Learn how to create an account, privacy settings, share photos with family and friends or contact long lost friends. Classes are on Mondays at 10 a.m. Space is limited so you must sign up at the Senior Center by stopping in or call computer. You must be a Senior Center member and classes are free. 34 Gabber February 20 February 26, 2014 Junior League to hold Whale of a Sale The Junior League of St. Petersburg (JLSP) announces today that the Whale of a Sale is back by popular demand. This legendary one day rummage sale is returning on Saturday, February 22. Doors will open at 7 a.m. at the University of South Florida St. Petersburg, Harbor Hall (former Dali Museum) located at 1000 Third Street S. The traditional sale will last until for one hour only, from 12 p.m. until 1 p.m., shoppers may purchase a large shopping bag for $10, to take Additionally, if you want to be the can attend the Sip and Sea Preview Shopping Party on Friday, February 21. Enjoy signature cocktails, light hors doeuvres, a cash bar and The Sip and Sea Preview Party will also feature DJ Ricky of Rhythm Makers DJs, blasting the tunes while you shop for great bargains. Tickets are now available for purchase, to experience this treasure hunting party. Tickets are $40.00 for the Sip and Sea Preview Party. Admission to the Saturday portion of Whale of a Sale is free. Purchase your tickets at www. jlstpete.org or mail a check to the Suite 201, St. Petersburg. Proceeds from this event will support the Junior League of St. Petersburgs community projects and programs. Gabber February 20 February 26, 2014 41 Four year old cat Daisy is looking for a loving family to call her own! This bright orange cat Daisy will brighten Are you thinking about opening your heart and home to a shelter cat? Adopting is the best way to go! Daisys "Shelly is a very playful Tortoiseshell girl, quite the character with her long swishing tail in action. She loves water and will jump in the bathtub when the water is draining. Playing with other cats is another favorite keep her family company. With copper color eyes and great Torti markings, Shelly is a beauty as well as a fun cat. Less than a year old, Shelly has been spayed, is current on her shots and is microchipped. Come and meet Shelly in her foster home in St. Petersburg where you can appointment. She will be a great addition to a family. Additional cats may be seen on SOS websitewww.saveourstrayinc.com. Save Our Strays SPCA Pet of the WeekSave Our Strays needs volunteers to foster felines Save Our Strays phone requests this month are all about baby kittens that need to be rescued. And SOS foster homes are full. Can you temporarily help foster a cat or litter of kittens for Save Our Strays? Applicants must be able to drive, have their own transportation and be available for a home visit from a current volunteer prior to fostering. If you are interested and willing to aid kittens in need, north county south county pet lovers may call 727 sos@saveourstraysinc.com organization dedicated to rehoming abandoned cats and kittens and does not maintain a shelter facility. The Cat Haven Offers New Adoption Site Now you can adopt a cat in the comfort of the Cat Havens adoption room where you can sit on a sofa and get acquainted with different cats. Save Our Strays, Inc. has opened the Cat Haven as a comfy retreat for adult cats that are seeking a second chance for a forever homes. Conveniently St. N., the Cat Haven is presently open for scheduled appointments. what you are looking for. Examples affectionate medium haired brown and white sweetheart. These are just a few of the adult felines available for adoption at the Cat Haven. All Save Our Strays cats have been spayed/neutered and tested for feline diseases. They are current on their vaccines and are microchipped. SOS, features, many cats on its website saveourstrayinc.com. 42 Gabber February 20 February 26, 2014 Somethin on my mind Somethin on my mindBy Bill Northr op B_Northr op@theGabber. com Marijuana. Part II Why mess around? Legalize, control and decriminalize the private use of all drugs. As I mentioned last week legalizing medical marijuana is less than nibbling around the edges. It is to legalizing recreational marijuana which my rational side doesn't favor. However, my rational side, in rethinking the whole issue, concluded that it might be more effective and of all steps and legalize everything. As I pointed out last week, a big part of this marijuana debate is about money. Legalizing all substances means bigger time money that can be taxed. There goes a huge underground, untaxed economy. And you thought it was about freedom? Nah. It's really about money and if it's about that don't take baby steps. I'm not joking. President Obama's public statement that marijuana is less harmful than alcohol had an effect coming from a former heavy user of marijuana and a reformed (we think) cigarette smoker. This was preceded by the Justice Department's ruling that they wouldn't interfere with marijuana use in Colorado and Washington(Alaska and Oregon and Florida would get the same pass). And, just this week the same department said they wouldn't prosecute banks that established banking relationships with marijuana growers, distributors and so forth. The law doesn't allow this, but apparently does now. Jamaica, grower and cultivator of weed and countries like Morocco and Uruguay conclude that with the U.S. leading the way, the world wide legalization of marijuana would create huge trade opportunities. Throwing in a few more commodities opiates or similar mind altering substances creates an even bigger pool. The poppy growers of Southeast Asia like Pakistan and Afghanistan would be happy. They are already doing a hearty illegal trade, but the crop eradication programs, often funded by the U.S., have created more corruption as well as deep resentment. Poppies are cash crops and often the only cash crops. By the way, those are the same poppies legal market and you solve a lot of poverty as well as political problems. South America and Mexico would backed its international trading companies and went to war with China (the Opium Wars) to force them to allow opium to be traded. There were other issues within this both countries. However, the upshot ban opium. Considering that almost all trade now is global, no one should have to go to war over the trade/drug issue. In addition, drug users in all countries (assuming our leadership would eventually draw in almost every country), would achieve ultimate freedom. downsides. While drugs like marijuana might be effective in (it is said to be seriously calming), the stronger drugs like cocaine and heroin might ultimately require individual monitoring and controlled distribution. For instance, about one in 12 marijuna users and one in 10 alcohol users get hooked, cocaine and heroin are several times more addictive. Tax revenues can provide It all can get quite complex with controls determined by the drugs and mixes of drugs. Heroin mixed with a touch of fentanyl is apparently killing thousands now, but with proper controls this wouldn't happen. Right now marijuana oils are being developed and used, but not particularly well controlled. This "a little dab'll do you" needs some oversight. However, I'm not certain what to do with the young kids who are using vapor pens in school. These in them. Mj is easy to hide. Everyone says kids are already doing it, so what difference does it make? The neurological damage to younger kids that some studies show doesn't apply to all. Nor do I know what to do about the deadly second hand smoke, or cookies and cakes. Smoking seems to keep the weight down anyway. As for strength, the government will control the dosages or servings or power, anyway. By the way, the already controlled drugs such as oxycontin and such are already controlled and those problems have to be addressed anyway. As for the other goodies such as ecstasy, meth, speed, LSDF, synthetic marijuana, inhalants, and mystic mushrooms, these need to be controlled and doled out as needed or wanted. From what I read and am told cocaine, and so on. If we can't stop them, and trying to stop them creates huge drug cartels and thus death and corruption, and billions of dollars of expenditures on policing and jailing, maybe it's time to join them. At least we'll all have a piece of the action. And that piece is much bigger than just a measly bit of a ragged leafed weed. Gabber February 20 February 26, 2014 43 THURSDAY FRIDAY SATURDAY SUNDAY MONDAY TUESDAY WEDNESDAY THURSDA Y FRIDA YS A TURDA Y SUNDA Y MONDA Y TUESDA Y WEDNESDA Y Lunch Served 11am-3pm Euchre 1pm Bingo 6pm Kitchen Open for Bingo Lunch 11-3 Ron's Karaoke 7pm No Lunch Served Breakfast Buffet 8:30-11am S.A.L. hamburgers and hot dogs 12-3pm Steakums 1-3pm Southern Knights Band 7-11pm Dinner 4:30-6:30pm Kitchen Open 11-2pm Dinner 4:30-6:30pm Southern Knights Band 7-11pm Lunch Served 11am-3pm Rons Karaoke 7pm THURSDA Y FRIDA YS A TURDA Y SUNDA Y MONDA Y TUESDA Y WEDNESDA Y Bar Bingo 7pm Food Served Steak Dinner 6-8pm Lee Jay Nelson 6:30-9:30pm Sports & Pizza 12-6pm Bucky Burgers 5-8pm Dee Karaoke 6:30-9:30pm Regular Mtg.-6pm Please attend, your input is valuable Wednesday Dinner Special 6-8pm Accordion Club Bar Bingo 7pm Karaoke 9pm-12am All you can eat Spaghetti & Meatballs every Wed., plus another special. Hot dogs every day for $1. Auxiliary meets 2nd Tuesday each month at 7 pm. S.A.L. meets last Monday of each month at 7 pm. 44 Gabber February 20 February 26, 2014 Following are some of the calls that Gulfport Police responded to during the past week. Friday 2/7 Assault/Battery5400 Blk Shore Blvd. S. Burglary Residence5400 Blk 23rd Ave. S. 911 Hang Up6200 Blk 8th Ave. S. Trespass900 Blk 58th St. S. Theft900 Blk 54th St. S. 911 Hang Up2800 Blk 52nd St. S. Fraud/Forgery1300 Blk 60th St. S. Burglary Residence5100 Blk 26th Ave. S. Person Under Inuence5200 Blk Jersey Ave. S. Saturday 2/8 Person Under Inuence5600 Blk 28th Ave. S. Noise5000 Blk 29th Ave. S. Theft5700 Blk Gulfport Blvd. S. Panhandler/Solicitor2800 Blk 48th St. S. Keep the Peace5800 Blk Tangerine Ave. S. Person Under Inuence5100 Blk Gulfport Blvd. S. Noise2600 Blk 53rd St. S. Sunday 2/9 Animal Call2000 Blk 52nd St. S. Theft4900 Blk Tangerine Ave. S. Burglary Residence2925 53rd St. S. Drug Call5500 Blk Gulfport Blvd. S. Burglary Residence6300 Blk 9th Ave. S. Theft5500 Blk Shore Blvd. S. Domestic5800 Blk 26th Ave. S. Burglary Vehicle4600 Blk 27th Ave. S. Hit & Run w/Injuries5700 Blk Gulfport Blvd. S. Monday 2/10 Burglary Vehicle1500 Blk 59th St. S. Animal Call2800 Blk 49th St. S. Burglary Vehicle1600 Blk 59th St. S. Fraud/Forgery5000 Blk Gulfport Blvd. S. Theft1900 Blk 53rd St. S. Burglary Vehicle1600 Blk 59th St. S. Animal Call2800 Blk 31st St. S. Trespass5100 Blk Gulfport Blvd. S. Hit & Run1100 Blk 59th St. S. Person Under Inuence1800 Blk 50th St. S. Trespass5600 Blk 28th Ave. S. Tuesday 2/11 Assault/Battery1800 Blk 50th St. S. DUI56th St. & Gulfport Blvd. S. Theft1000 Blk 49th St. S. Person Under Inuence2800 Blk Dupont St. S. Prowler2100 Blk Premier Dr. S. Domestic700 Blk 61st St. S. Burglary5320 31st Ave. S. Wednesday 2/12 Theft1000 Blk 49th St. S. Panhandler/Solicitor3100 Blk 57th St. S. Person Under Inuence2800 Blk Dupont St. S. Prowler2100 Blk Premier Dr. S. Domestic700 Blk 61st St. S. Burglary5300 Blk 31st Ave. S. Fraud/Forgery1000 Blk 49th St. S. Burglary Residence5600 Blk 15th Ave. S. Theft1700 Blk 59th St. S. Thursday 2/13 Burglary Vehicle5200 Blk 9th Ave. S. Vandalism3000 Blk Beach Blvd. S. 911 Hang Up2500 Blk 53rd St. S. Fraud/Forgery5700 Blk 18th Ave. S. Fraud/Forgery2700 Blk Kipps Colony Dr. S. Animal Call1100 Blk 60th St. S. Burglary Residence3100 Blk 59th St. S. Accident with Injuries51st St. & Gulfport Blvd. S. Person Under Inuence4900 Blk Gulfport Blvd. S. Domestic5400 Blk Essex Ave. S.
Gabber February 20 February 26, 2014 47 Senior Excursions in St. Pete Beach The St. Pete Beach Community Center has new Senior Excursions on the schedule. The excursions are a great way for local seniors to travel with their friends and make new ones! The new trips are as follows:: 21st: Winter Park Art Festival. All excursions will depart from the St. Pete Beach Community Center, 7701 Boca Ciega Drive. Trip times vary. the Wednesday prior to the excursion. Each trip is $12 for residents of residents. Cost covers transportation only. All admission or lunch are extra and the responsibility of the participants. For more information Once a Month Introductory Digital Photography Workshop Do you feel overwhelmed by all the features your camera offers? Are you unsure what your camera can and cant do? The St. Pete Beach Community Center, 7701 Boca Ciega Drive, will offer an Introduction to Digital Photography Workshop on February 20th, March 20th, April 17th, and May 22nd. Classes start at cost only $10 per person. In this workshop the complete novice will gain a solid understanding of their compact digital camera or the basic features of their digital SLR. They will leave the workshop with the fundamental knowledge needed to embark upon a lifetimes exploration of photography. After taking this workshop, participants are eligible for the Intermediate digital workshop. Please register by Tuesday before the class is scheduled. For more charged battery) and a pen or pencil for any notes. Gabber February 20 February 26, 2014 49 Senior Hall of Fame Inductees Sought nominations for inductions into the of Fame which honors volunteers resident of Pinellas County and have St. Petersburg community. Previous inductees include organizations such as the Florida Orchestra, museums, schools, churches, neighborhood associations, military groups, police and many more. The awards ceremony will be held Street North on Wednesday, May 21, Ten winners will be inducted into the Senior Hall of Fame, given a city and will be honored at a city council meeting. application or visit the website http:// aging.html for an online application. Deadline for applications is April 10, 2014. Sponsored by city of St. Petersburg Parks and Recreation. For more information on more exciting activities see www.stpeteparksrec. org. BOGO Sale on Aquatic Membership The St. Pete Beach Aquatic Center has an offer you wont want to miss. January 1st through March membership and you will get 6 months free. This offer is valid on the purchase of a child, adult, senior provides access to the heated pool with lap swimming, sun bathing, picnic areas, two tubular water slides, a childrens splash zone and much more! Starting January 1st, stop by the Aquatic Center, 7701 Boca Ciega Drive, to purchase your membership. For more information visit www. 52 Gabber February 20 February 26, 2014 Of Rats and Rescues Right now, the Most Interesting rat tea. What is that? Well, rat teas curious know what? Im not sure what else. Maybe water. Maybe just rat pee. I think I'm happier not knowing. Oh, you mean why? Because she went to an EarthDog practice test today. It's an obstacle course of tunnels, built just for dachshunds and terriers, with a caged rat at the end. The goal is for the dog to make it through the course and "work" the rat for a full 60 seconds. Go ahead. Call PETA. I'll wait. The rat, for what it's worth, seemed unphased by this. He appeared (and don't exactly dress the rats for the occasion) only mildly curious about Calypso and unnervingly calm as she barked and scratched and bit at the cage. I had my concerns about cruelty, but honestly, this was a white rat. Calypso was one of no less than 10 dachshunds at the event. Except Calypso, who is too small to qualify as a proper dachshund and doesn't have the proper Roman nose for the breed standard, they all were excellent examples of badger hounds. Here in the 'port, we're nuts about our pets: in 2004, the city spent months debating if, when, and where to build a dog park. We have an annual Get Rescued street festival celebrating our love for all pets, and don't even get me started on ducks, chickens, and other barnyard friends. Every year at Get Rescued I feel guilty for how I chose Calypso: I bought her from a family in Lakeland when she was three months old. Rescuing was all I knew until my from the Humane Society as a puppy without her and I knew I didn't want to come home to an empty house a second night. I wanted a dachshund, because the size and temperament appealed to me, and I knew I wanted a puppy, because when you've just looked into your dog's eyes as she closed them for the last time, you want your next dog in your life as long as possible. No area rescues or shelters had a dachshund puppy, so I started calling newspaper ads. Within three hours, I had a sleepy, somewhat confused, warm black and tan puppy in my lap, and while nothing could make me miss Madison less, it sure did help to have stroke Calypso's sweet puppy breath on my face. After six years of ambivalence, I realize buying a purebred from a breeder with the parents on premises doesn't make me a bad person. The bottom line is this: if you want a dog, get a dog. If you feel strongly about using a reputable breeder, I will never judge you, nor should anyone else. But if you just want a dog because you want a dog, dont overthink it. Go to Get Rescued and start the process of adopting one. Or go to Animal Services, the Humane Society, SPCA, or PetPal. who dont plan to breed or show the puppy mills. In the meantime, that frees up kennel space in those longer to live before, given space constraints and budget cuts, they have to be euthanized. a dachshund, a mastiff, or anything in between), please look at rescues Rescued should have just about every breed represented, so there's a good place to start. Just because I our local doxie rescue the instant I wanted one doesn't mean you won't. People surrender pregnant dogs all the time. It's been almost six and a half years since the Most Interesting Dog in the World came into my life, and I've never regretted getting her the way I did. I wish I could have rescued a dog like her, but I'm a big proponent of responsible breeding, too. Remember, bad bloodlines are how we end up with dogs who attack and maul damned pit bulls, Rotties, German Shepherds, and Dobermans) as well as dogs with health problems that take them away from us far too early. For all her breeding, Calypso doesnt care about bloodlines, and neither do I. Breeding doesnt keep her from from the litter box. So maybe this weekend Ill sweet talk El Cap into taking a stroll through Get Rescued and see which pup pulls at his heart. Of course, Im not sure Im ready for another dog. After all, there's only so much rat pee I can take. Gabber February 20 February 26, 2014 55 Built Circa 1927 Indoor/Outdoor Dining Plenty of FREE Parking Indoor/Outdoor Dining Plenty of FREE Parking $1 1.95 $8.95Prime Rib Mondays New Sunday Hours ~ Open Noon for LunchMacadamia Crusted Mahiw/ small slaw & mashed SPECIALS DISCLAIMER: While supplies last. Dine-in only. No sharing. Not good with any other offers. Expires: 2/23/14 Expires: 2/23/14 Sunday, Noon~4pm 2913 Beach Boulevard 727-343-2583 BacknBlueCafe.com Become a Donor Employees at the Pinellas County up with Donate Life Florida this month to make Floridians aware of registering as an organ, tissue and eye donor. April is National Donate Life Month, and tax collector employees are participating in the annual long effort among tax collectors and the Florida Department of to promote awareness of Floridas organ donor registry. Tax collector employees help register potential organ donors by asking all driver license customers if they would like to join the registry. Last years Donate Life Challenge led to more than 66,000 new donor registrations throughout Florida. Floridas organ registry recently reached a milestone of 7 million registrants. It is the second largest state registry in the nation, which gives hope to families of patients received a liver transplant before she reached age 2. Although my husband and I were both registered organ donors, we didnt give much thought to organ donation until Hope was 64 days That was the day we found out she may need a liver transplant. We dont know much about Hopes organ donor, but we feel like they are part of our family. Their loved one saved our Hope. currently await organ transplants, on the nationwide list. Florida offers four simple ways to register as an organ, tissue or eye donor. at www.DonateLifeFlorida.org. license online at www.GoRenew. com. 58 Gabber February 20 February 26, 2014 ALL LAWN & LANDSCAPING-Property Maintenance. To Many Services to List. Florida Certied. Call Tony 727-639-2199.EXPERT SPRINKLER REPAIR Rich Moseley, Irrigation Contractor. 25 Years Experience. Reasonable Rates. Well & Pumps. 439-0792. Lic.#C8312. BBB Accredited. EAST OUTDOOR SERVICESHonest, Reliable, Licensed. 20+ Yrs. Experience. Landscaping/Mowing. Springtime planting, make your old beds look new. Referral Discount. Call Eric for all your outdoor needs. 727-612-4200. LAWN & HAUL-Affordable Prices. Roof Cleaning, Mowing, Hedge/Tree Trimming, Brush Removal, Code Violation Clean-Ups, Debris Hauling. Dependable. Senior Discounts. Dave, 727-215-2229. NEIGHBORHOOD LAWN CAREMowing, Trimming, Edging, Clean-Up, Quality Service, Reasonable Rates, Free Estimates, Senior Discounts. Licenced & Insured. 727-2027557. Marine Repair COMPLETE BOAT REPAIR, RESTORATIONGelcoat, Fiberglass, Paint, Woodwork, More! 810-394-5011 pcw1954@yahoo.com DANS HAULING-727-341-1135. Full Service Clean-ups. Drop Off Trailers. Painting PINNIX PAINTING INC.Interior, Exterior. In Business Locally Since 1980. Free Estimates. Commercial Residential References Upon Request. Lic. #C4334. 548-9293. WHEN QUALITY COUNTS-Trust Masters Painting. Making happy customers for 30yrs. Pressure Cleaning, Honest, Reliable. 727-3441674. References/Guaranteed. Lic.#C4749. Recommended on Angies List. Plumbing $69 DRAIN CLEANINGSenior & Military Discounts available, 24 hour emergency service, no overtime/trip charge. Call Now! Lic.#CFC1428321. 727-678-4471. LINGOS PLUMBING RELIABLE-Repairs, Replacements, Fixtures. Sewers, Cleaning, Remodels, New Construction, Better Business Bureau Lic.#CFC1426040. 727-403-9523.SMALL JOB PLUMBINGSeniors Discounts, CFC1427888 Low Rates 727-522-2508. MasterCard/Visa. BEACH CONST & PLUMBING SERVICES#C7128. Senior Discounts, All Plumbing Needs. No Overtime Charges. 40+ yrs. Experience. 727-421-4903. Bill Strickland. Miscellaneous Service BABYSITTER-PETSITTER AVAILABLE!Monday-Friday 3-10p.m. (at the latest). Saturday-Sunday 9a.m. (as late as needed). Flexible rates. 727-744-7809 or brennahenderson@hotmail.comTENNIS RACQUET STRINGING35 years+ experience. Pickup & Delivery Service Avail. 5-mile radius. Former teaching pro. 727-776-1646 Help Wanted VISITING ANGELSMature companions, homemakers, CNAs needed for elderly adults. Flexible schedule. Call Visiting Angels today. 727-822-3034. PROFESSIONAL CRAFTERSWork at Home. Contract Work: Requires $40 Materials Fee, Glue Gun & Transport a Must. J&K Novelty, 727-527-1816 EUROPEAN WOMAN WANTED-To look after elderly couple in St. Pete Beach. References required. Call 727-367-2526. PERSON TO ASSIST-Handicapped Female with Personal Care/Light housework. Finger Print, CPR, References after 4pm 727-5461267. DRIVER WANTED-727-515-7636. LOOKING FOR STYLISTw/Clientele, Booth Rent, $125/Wk. Central Ave. 727-343-6187. DRIVERS: $5,000 SIGN-ON BONUSGreat Pay! Consistent Freight, Great Miles on this Regional Account. Werner Enterprises, 1-855517-2507. Lawn/Landscape Moving/Hauling Plumbing PLACE YOUR AD HERE Starting at $15 per issue. Call 727-321-6965. Gabber February 20 February 26, 2014 61 TENANT NOT PAYING For Fast, Reasonable Eviction Service, Call Gulfport Attorney Karen S. Keaton, Gulf Beaches Law, P.A. at 727-822-2200. S. PASADENA WATERFRONT-Efciency, 1st Floor, w/screened porch. Lovely Pool, Fishing Dock. Quiet and Peaceful. 55+, No Dogs, References. $485/Mo. 727-384-6103. 2BR/2BA HOUSE ARTS DISTRICTLarge Yard, Garage, W/D. Walk to Beach, Restaurants, Library. $1400/Mo., $1000 Security Dep. 2714 53rd St. S. 727-643-9329. NEED A NEW PROPERTY MANAGER? Repair Bills to High? Call Dan Yingst Realty Today. Excepting New Gulfport/Pasadena Accounts 727-321-5258. S. PASADENA 2BR/1BA HOUSEUtility Room, Excellent location close to Publix, tenants pay all utilities except garbage pick-up. $865/Mo. 727-345-7036. SMALL QUIET EFFICIENCIES-All utilities included. $100/wk. and up. Need PT Computer Tutor, Maintenance person, and Housekeeper, Possible live-in. 727-289-3588. 3862 12TH AVE S.2BR charming bungalow. Prefer Housing Authority. (Will consider 1BR voucher). Available April or before. $750-$850. 727-347-3555. PLACE YOUR AD HEREStarting at $15 per issue. Call 321-6965. Accommodations to Share HOME TO SHARE-Non Tobacco Users Only!. Furnished, Cable, Concrete Parking, Washer/Dryer, Fenced Property, Utilities Included. Security Deposit, $90/Wk. Neat & Clean. 727323-1039. Commercial Properties Rent 1626 49TH ST. S. GULFPORTBeauty Salon, Fully Equiped, 4-stations, Water Included. 1638 49th St. S. Ofce/Store available. 727527-6102. 2 GROUND FLOOR CONDOS Both Attractively Furnished. Spacious 1BR, Screened Porch, Newer A/C and Energy Efcient Windows. $49,900 Also 2BR/2BA, W/D, As Is, $56,950. Patriot Square Gated 55+ Community 39th & 41st Blocks of 37th St. S. Tony Branch EARNEST REALTY 727-460-7887. MILLION DOLLAR VIEW-for a fraction of the Price! 1BR/1.5BA, Completely Updated. 1175sqft. Embassy Bldg. Town Shores 4th oor. 219-508-5528. TOWN SHORES ETON #102-Updated Open Floor, Carport, Deluxe, 1060sqft. 1BR/1BA. Must See, Great Buy! $74,900 440-382-9772. CHARMING GULFPORT BUNGALOW2BR/1BA, plus bonus room with additional kitchen & bath. Wood/Tile oors. Includes newer furniture, appliances and laundry. Landscaped w/citrus, fenced patio & 2 sheds. $195,000. 541-829-7309 Jaimeframe@aol.com MAGNIFICANT VIEWof Tampa Bay. On Beach Drive, S.E. St. Petersburg. Duplex Block Home. 2BR/1BA/2CG/ $299K. Owner will hold $99,000 mortgage. 727-623-9532. A.M. ACROSS FROM GULFPORT BEACHUnfurnished 1250SF, 2BR/2BA Condo. Spacious Bright and Airy Corner Unit. $109,500. (Town Shores 55+ Community) 727-510-3715. Real Estate for Rent Real Estate for Sale Real Estate for Sale PLEASE PRINT your ad as you want it to read, one word per line REMEMBER: THE FIRST 3 WORDS WILL BE BOLD-THE PHONE # COUNTS AS A WORD T OO! SELECT AC AT EGOR Y: (1) $4 .50/$15.00 (2) $4.50/$15.00 (3) $4.50/$15.00 (4) $4.50/$15.00 5) $4.50/$15.00 (6) $4.50/$15.00 (7) $4.50/$15.00 (8) $4.50/$1 5.00(9) $4.50/$15.00 (10) $4 .50/$15.00 (11) $4.70/$15.00 (12) $4.90/$15.00 (13) $5.10/$15.00 ( 14) $5.30/$15.00 (15) $5.50/$15.00 (16) $5.70/$15.00 (17) $5.90/$15.00 18) $6.10/$15.00 (19) $6.30/$15.00 (20) $6.50/$15.00 (21) $6.70/$15.40 ( 22) $6.90/$15.80 ( 23) $7.10/$16.20 ( 24) $7.30/$16.60 (25) $7.50/$17.00 ( 26) $7.70/$17.40 (27) $7.90/$17.80 MAKE CHECKS PAYABLE TO: The G ABBER 1419 49thSt. So., Gulfport, FL 337 07 adv ertising@thegabber .com www .thegabber .com / NAME ON CARD PHONE NUMBER CARD #Z IP CODE EXP. DA TE PERSONAL ITEMS $4.50 for 10 Wo rds and 20 each additional word. COMMERCIAL ADS $15.00 for 20 Wo rds and 40 each additional word Cl assified Ad v ertising F orm MOVE-IN READY!3210 36th Ave. N. 3BR/2BA, 1653hsf, Total Remodel: new roof, windows, a/c, kitchen, cabinets, appliances, tile oors. $151.500 Easy Show, David Hunter, 727-244-0989. CRR.